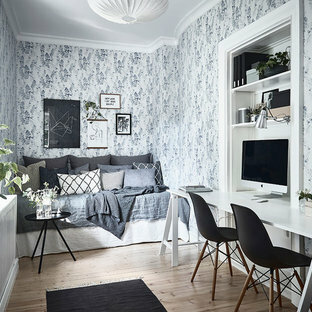 Convert a small space to a polished eye-catching and functional home office. We used white painted maple wood veneers and solid wood painted doors, moldings and trims to give the space a formal style. 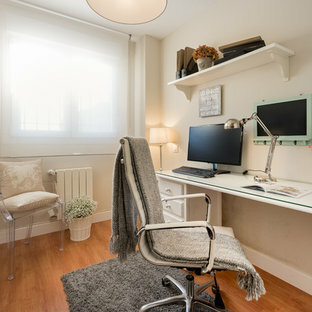 This home office boasts under cabinet LED lighting, doors with glass inserts, upper cabinets surrounded by wrap around shelving for books and accent pieces and sturdy maple wood drawers for storing office supplies or filing important documents. Custom steel shelves are cantilevered from a grey lacquered millwork wall. All of the computer peripherals are stored inside the white oak cabinets. 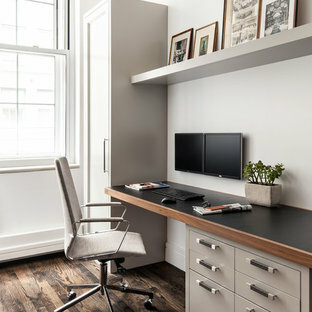 A cable management system and integrated power inside the cabinet and on the desk top keep the surfaces clear or clutter.